This story is about a mother’s love for her son with cerebral palsy and how she went on to help lots of other children with cerebral palsy. 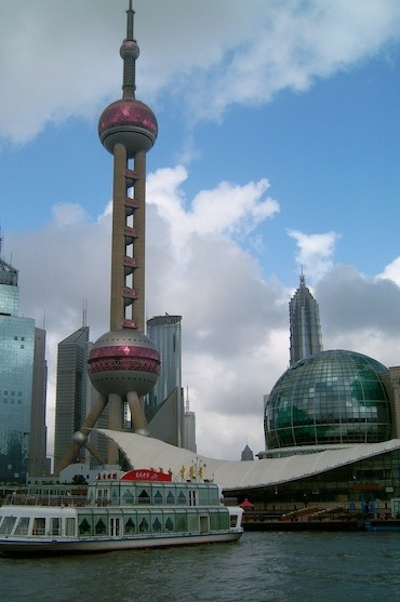 In China, there is a large city called Shanghai. Shanghai is an amazing place. A river runs through it and on either side are the tallest skyscrapers you will ever have seen. This is a picture of Shanghai. You can see the river and some of the tall buildings. There is a woman called Gao Ya Li who lives in Shanghai. She had a baby son and was so happy when he was born. She named him Lulu. After a few months she noticed that Lulu wasn’t doing the same things that all the other babies his age were doing. She was told he had something called cerebral palsy. This meant he had problems with his muscles, so he could not move them in the same way other children could. Gao Ya Li was very sad. Gao Ya Li wanted to help her son very much. She went to all the hospitals in Shanghai, but nobody could help Lulu. She travelled around to different places in China for four years, but still she could not find anyone to help her son. She says that she travelled over almost half of China – and China is one of the biggest countries in the world! Gao Ya Li started to learn how people helped children with cerebral palsy in places like Europe, Australia, Canada and Hong Kong. Since she could not find anyone to help Lulu in Shanghai, she set up her own centre for children with cerebral palsy. At this time, Lulu was about six years old. Lulu is now a teenager. He was helped much by his mum’s centre and went on to go to secondary school, just like all the other children his age. Now, Gao Ya Li’s centre helps a lot of children, just like it helped her son. 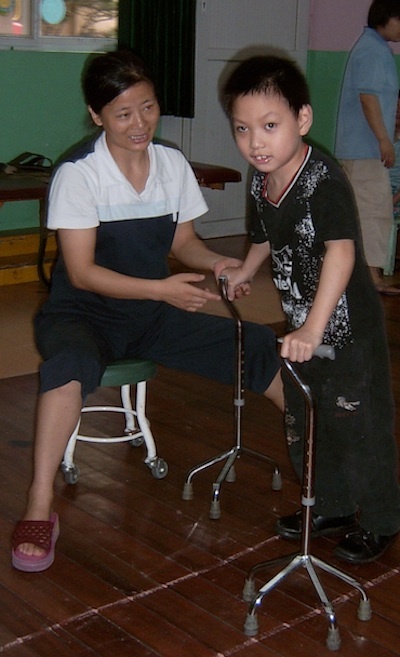 This pictures show the staff at Gao Ya Li’s center helping a boy to learn to walk. This pictures show the staff at Gao Ya Li’s Centre helping a girl so she will be able to use the muscles in her arms.